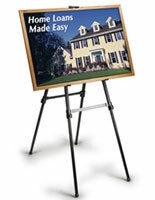 Need a portable sign holder or canvas stand for your studio or event? These adjustable easels collapse for easy transportation and storage. 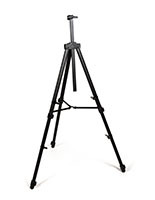 Our tripod displays are made of a sturdy, lightweight aluminum that won’t weigh you down between presentations on the road. 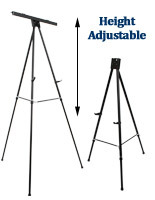 Adjustable easels with telescoping legs are designed to hold heavy poster frames and flip charts, often many times their own weight. The stand-out design of these collapsible graphic stands excels at grabbing attention at office conferences, art galleries, and even at trade shows. Our adjustable easels with telescoping legs make presenting large marketing posters or supporting artwork a breeze and ensures each firmly finds its place in the center of attention. 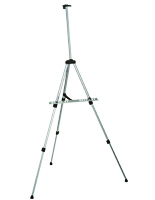 What options are available with these collapsible tripods? 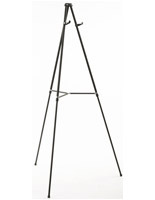 Adjustable easels come in a variety of designs to accommodate artistic and promotional use. 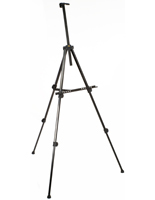 Most of our telescoping tripods are made of aluminum that's both lightweight and durable — perfect for travel. However, some are made of plastic for an even lighter fabrication that's ideal for frequent transportation. Many collapsible easels switch between floor and countertop standing display, accommodating different environments. Traveling sales representatives can present their pitch on the floor of an empty conference room or on the desk in a cramped office. No matter where these fixtures are set up, they adapt to your specific needs. 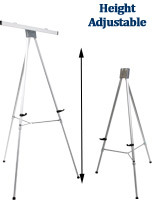 Portable display stands with a top clamp support flip charts and secure poster frames. This holder has a changeable design to fit media of different sizes and thicknesses with ease. Models without clamps are also available, allowing the graphic to simply rest on the fixture's arms. 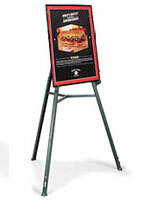 Easels with a poster holder are great as all-in-one solutions in retail stores, restaurants, theaters, and conventions. Our selection of quick change snap open frames feature new promotional graphics and event information with ease. Simply roll back the edges for access to the print and the clear protective lens. Our floor standing and countertop displays can include a convenient carrying bag that's ideal for transportation. Traveling sales reps, artists, and trade show exhibitors all benefit from these lightweight graphic holders. 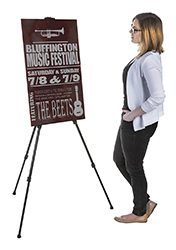 Portable easels are excellent for calling attention to ads, artwork, and event info. Their striking angled design always stands out from other fixtures, assuring that passersby will take a look. That's why convention centers and hotels often use them to notify where events are taking place. Trade show exhibitors present with these folding marketing tools as they're easy to transport. It's easy to feature these fixtures on the floor or the booth to match any expo's space requirements. 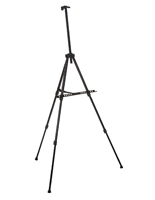 Telescoping tripods with flip charts are unbeatable for featuring commercial and educational presentations. They are easily moved from location to location and once set up, have a large display. Feature lots of important information without having to accommodate the various computer systems that companies and schools use. 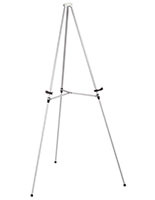 Look no further when deciding how to pitch your great idea to the world with telescoping easels .